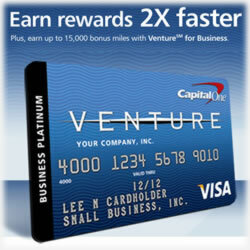 The Capital One Venture Card is a Visa for businesses that allows for earning rewards twice as fast, with the ability to get bonus points just for meeting certain criteria within the first few months of owning the card. The bonus miles can go towards your purchase miles for great rewards. Once you have your card, earning bonus miles is easy. Enjoy bonus miles as a free way toward your reward. It brings you closer to where you want, without having to wait. Travel or shopping, it’s your choice. There’s different ways to earn bonus miles. You can earn bonus miles by signing up for additional cards within the first few months of your card. This way, you can get additional employees their own card, making it easier for you to go about your business. You will empower your employees to make purchases on your behalf so you can tend to other aspects. You can also earn bonus miles by spending a certain amount within the first three months of having the card. All these different bonus points add up quickly. These, combined with the purchases you make, allow you to cash in on a variety of rewards. Each time you make a purchase with your Visa, you will earn two points per mile. Many cards only give you one, so this means you accrue twice as fast. The Venture card is for businesses, so the card comes with a variety of tools to help your business. Your monthly statement will be broken out to see what each employee spends. You will be able to track between personal and business expenses. At the end of the year, you will receive an itemized report. It will give you details of your spending throughout the year. This is a helpful tool to make it easier to plan and budget for the following year, as well as prepare taxes. There is purchase security and protection that comes as Visa card benefit. It gives you retail protection against items that you didn’t want and need to return. If an item is lost, stolen, or damaged, it could also be covered if it was purchased with this card. Plus, there’s fraud protection. If you card is lost or stolen, you won’t be responsible for any fraudulent purchases. The card is all about protection – something that cash or store accounts can’t give you. The card makes it easier for accounts receivable. No added paperwork. No need to complete tedious applications for individual store accounts to cover your business spending. Using your card will make the purchases you need for your business, all the while earning rewards. Your card is a Visa, which means it’s accepted virtually everywhere. The possibilities are endless. You can use the card when you want, where you want. It’s accepted at millions of locations worldwide, as well as online, so you can buy everything you need for your business. Booking online airfare, making dinner reservations, buying parts, ordering stationary and even paying bills – you can do it all with your Visa card. The No Hassle Rewards card comes with a variety of flight benefits. When you redeem miles, you can enjoy no seat restrictions and no blackout dates. This means you can fly when you want, without your credit card company telling you that you have to reschedule. There’s no limit to how many miles you can earn. If you’re saving for a special reason, there’s no stopping you. The miles continue to accrue for as long as you have the card. Enjoy travel assistance. When you rent a car using the credit card, you’ll have auto rental collision. There is travel and emergency assistance as well, both domestically and internationally. Being a card member gives you access to discounts. You will have access to a variety of business hotels at a discount. When you dine, you’ll also be able to use the Visa dining benefits to your advantage across the world. The card can be applied for directly online and they try to give a response within sixty seconds. Upon earning the card, you can begin to work towards your bonus points to get immediate travel rewards with the card.